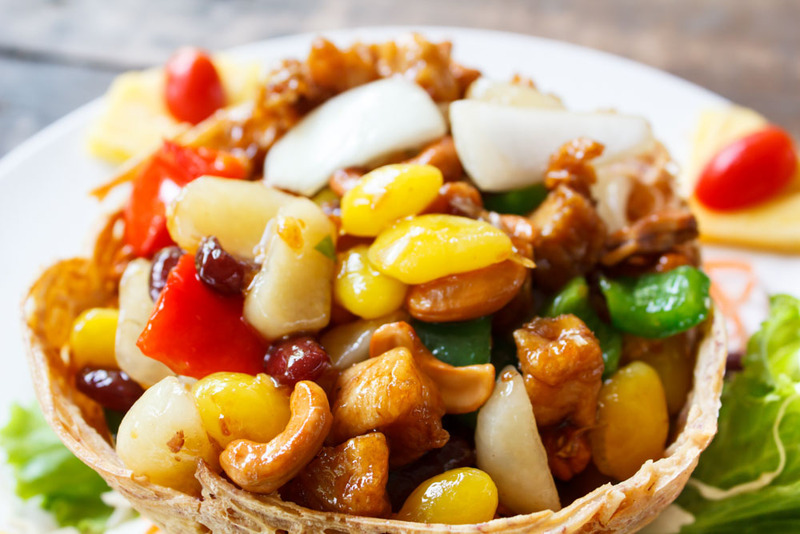 stir fried chicken with cashew nuts, a famous thai food. 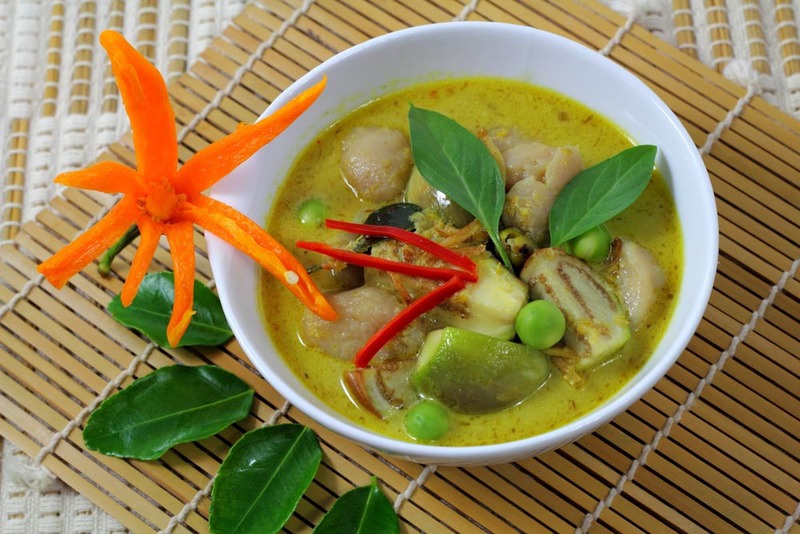 Thai food is one of the most renowned in the world, because of the unique of the taste which is spicy, sweet, salty, and sour blended perfectly together. Moreover, Thai food is one of the good in term of nutrition’s choice as the ingredients which we put are full of nutrient. 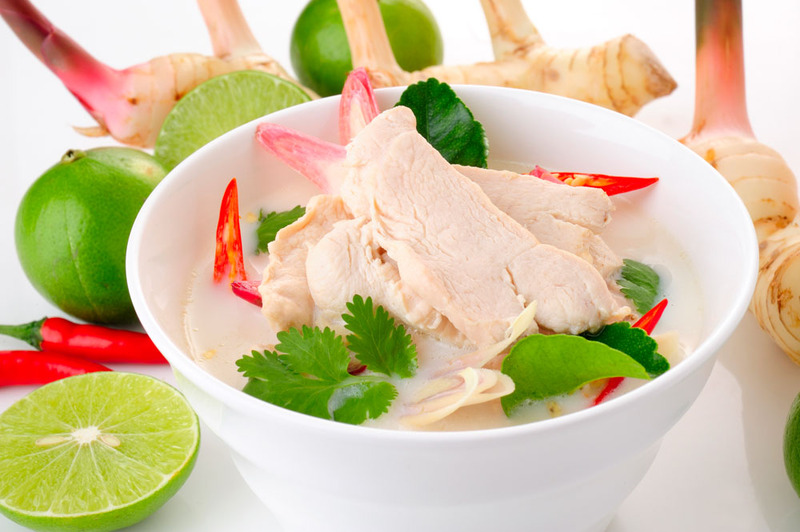 Tom Kha Gai is another aromatic hot soup that has a finely rich taste from coconut milk. It contains galangal, lemongrass, Thai chili peppers, kaffir lime leaves, mushrooms, chicken, lime juice and fish sauce. This soup is very perfect by itself or you can alternatively serve it with jasmine rice for a complete meal. Once you touch the silky taste, you will never forget. Pad Ka-prao is a quick and easy dish, yet very delicious and hot! You can choose to use any meat you prefer (minced pork, minced chicken, or seafood) plus it requires no special set of ingredients. It just needs Thai basil (Ka-prao), garlic, Thai chili peppers, and your choice of meat then season it with fish sauce, oyster sauce, and a little bit of sugar. Pad Ka-prao goes best with jasmine rice and fried eggs on top of it. 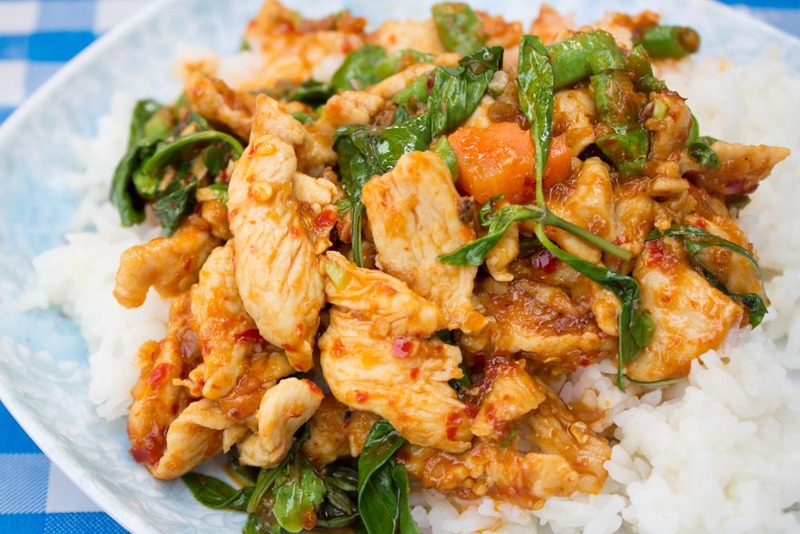 It is absolutely a perfect Thai fast food everyone loves. Different than any other Thai stir fry dishes, Kai Pad Med Mamuang Himapan uses cashew nuts and dry chilies to bring up the great taste. Fry the chicken breast with garlic, onion, cashew nuts and red chilies. Add some dry chilies to spice it up a little bit and make the dish more colorful. No need to serve with jasmine rice, this dish is already perfect by itself. One of the foods everyone loves to try when visiting Thailand. 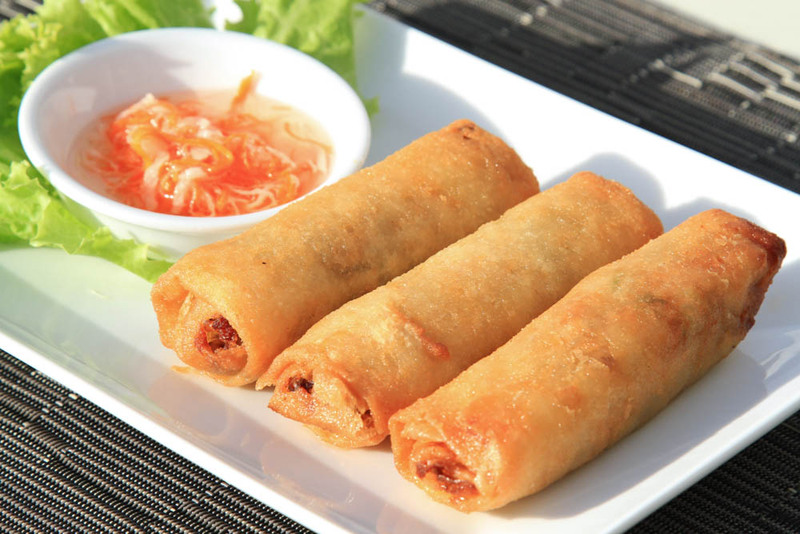 Thai fried Spring Rolls consist of various veggies, glass noodles, meat of your choice wrapped with spring rolls wrappers. Serve hot with Thai sweet chili dip. This dish plays a role of Thai finger food so it is definitely perfect for a party. Jasmine rice is not required, you just grab it, dip it in the sauce, and test the amazing flavor right away. Hot and spicy curry that is originally from India. It requires curry paste added with chicken and coconut milk. Season it with fish sauce, sugar, and add more red chilies to decorate the dish. Alternatively, you can change from chicken to beef if you prefer. The cooking steps are not very difficult but it requires a very fine curry paste to bring up the taste and make this dish so wonderful. 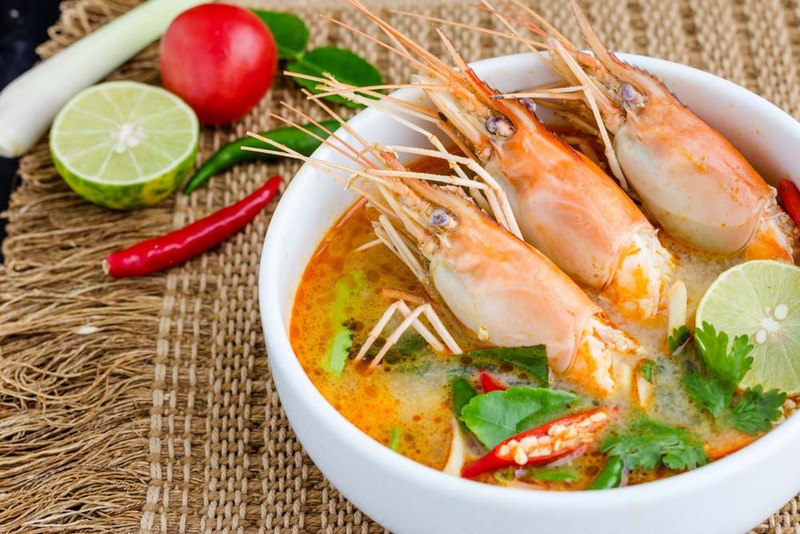 The very classic Thai soup that is known worldwide for its wonderful taste and herbal ingredients. Lemongrass, galangal, kaffir lime, chili peppers, mushrooms, cilantro, onions, and tomatoes are all gathered in this amazing-taste dish. Fresh shrimps will go absolutely perfect with this hot and spicy soup. You can choose to leave it clear or add a little coconut milk to make it a little richer. 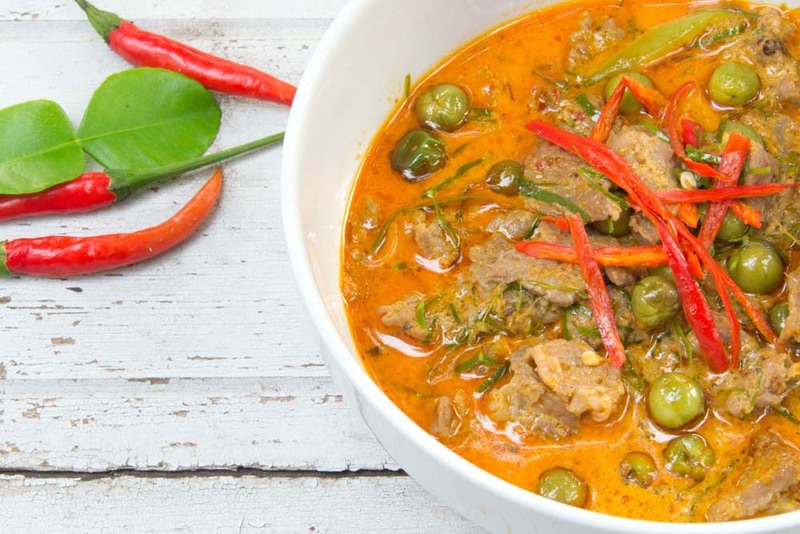 Originally from Muslims, this Thai curry is commonly made with chicken or beef. Rich with coconut milk, potatoes, cashews, and herbal ingredients like bay leaves, cinnamon, star anise, and cardamom pods. Season with fish sauce, tamarind sauce, chili, and palm sugar. The curry that offers a sweet with a little bit of hot and spicy taste has been famous for more than a hundred years. 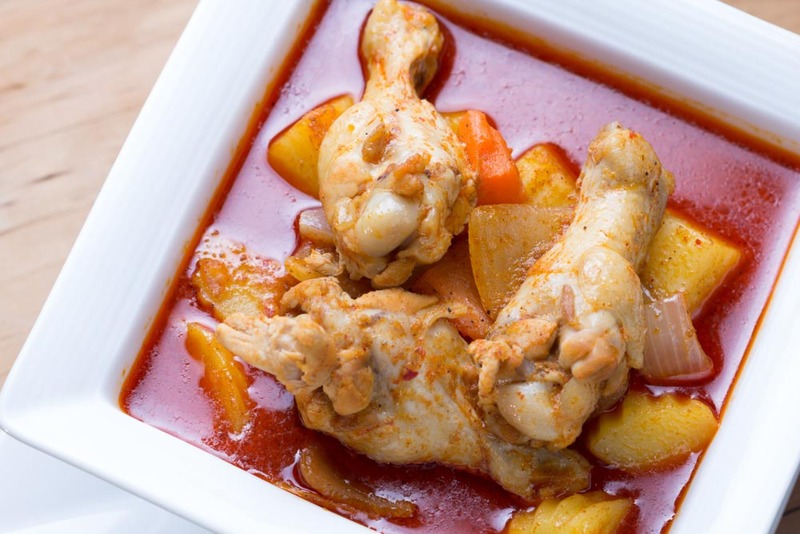 CNN once ranked the Massaman Curry as one of 50 most delicious foods of the world. Another popular dish that you wouldn’t want to miss, Thai Green Chicken Curry is famous for its fragrance and rich taste. Boil lean chicken, fresh Thai basils, mushrooms, lime leaves, Thai eggplants and Turkey berries with green curry paste and coconut milk, and season it with fish sauce and palm sugar. You can add more green chili peppers to spice up a little bit more. The aromatic smell of this sweet and spicy curry will make your stomach growl. Som Tum is right for you if you are into a spicy healthy dish to spice up your day. It is originally from Thailand’s North Eastern (Isaan region) and very popular among locals and foreigners from all over the world. 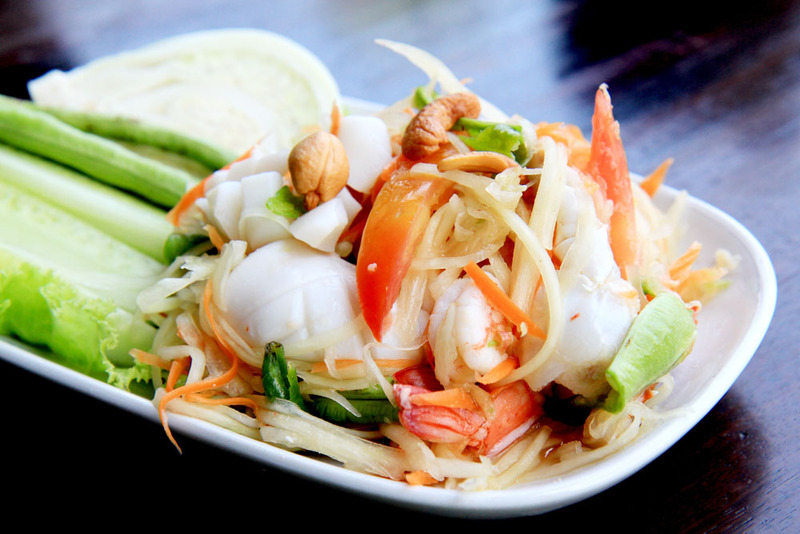 Green papaya gives crispy texture, dried shrimps and roasted peanuts gives a little salty taste while cherry tomatoes gives you sour taste in your mouth. Fish sauce, lime, tamarind juice and palm sugar will blend everything together. Som Tum is always served with grilled chicken for a perfect combination. A delicious dish that is a must for everyone who visits Thailand. 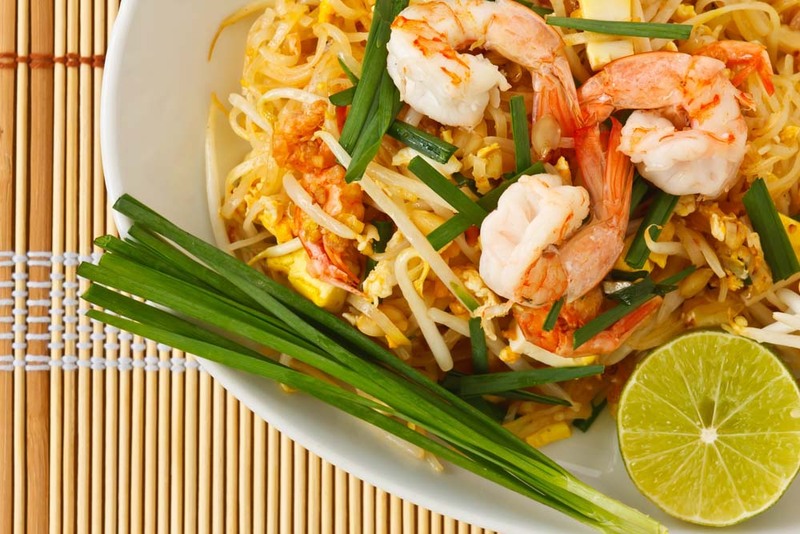 Pad Thai means “fry noodles in Thai style’ so it contains different components than other Thai dishes. Rice noodles, fresh shrimps, dried shrimps, eggs, firm tofu and season it with tamarind sauce, fish sauce, and red chilies. Add roasted peanuts and bean sprouts for a perfect finish. This popular dish is easy to prepare and cook, and will definitely impress you since the very first taste.